Today: Sophie Missing and Caroline Craig, authors of The Little Book of Lunch, make a posh version of Cup O' Noodles for a unique desk lunch. Just add water. After years of spending unthinkable sums on dry, under-seasoned sandwiches, watery soups, and disappointing salads made of sad, wilting leaves and little else, we decided enough was enough. It was time, we thought, to reclaim our midday break from its monotonous, financially ruinous routine and call it quits on using the phrase, "What do you mean you've sold out of artisinal cheese baguettes?" It was time to transform our lunches into something more than just an afterthought. 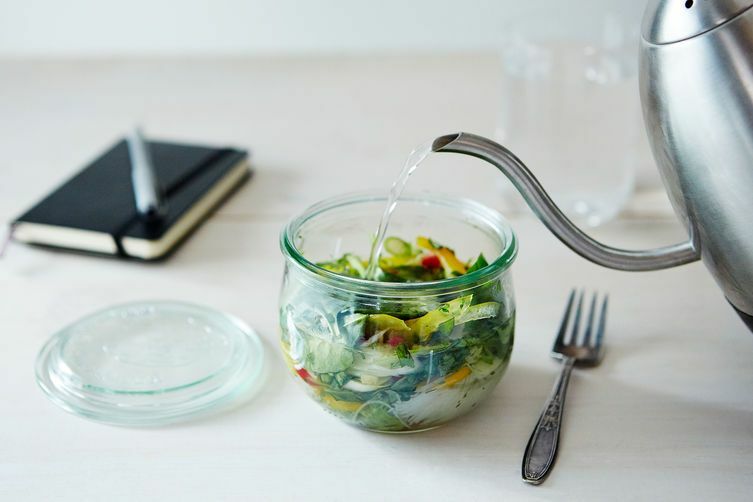 And while we're firm fans of the lunchtime staple, the sandwich—be it a banh mi or open-faced number—there are some days when we want something that requires utensils but is work-kitchen friendly. This, however, can be a lot to ask for. Work kitchens are not usually the stuff of cooking dreams. They are often barren spaces without so much as an unsoiled teaspoon with which to remove a tea bag from your mug, let alone luxe items like microwaves (or plates). Thankfully, given the addictive nature of caffeinated hot drinks, they do usually contain a kettle. If they don’t, then turn to your local coffee shop—most will give you a cup of hot water for a miserly fee, if not for free. This is where our just-add-water, desk-side pho comes in handy. Slice or peel vegetables as finely as possible—remember that you’re not simmering anything on the stove, and thinner vegetables will lose that raw crunch more quickly. A mandoline is a good and inexpensive tool to invest in: Just watch your fingers. This is totally not pho. Disgrace. I was wondering the same thing. Has anyone answered? I'd love to know and be able to prep a few ahead. Thinking about it you could have a small amount of sliced chicken in a zip lock and put it in the jar just before you decide to add the water for your fresh soup. I can hardly wait to try it. You can get the Weck 16.9 ounce (aka 1/2 liter) from Cost Plus World Market for a fraction of the price of other retailers. My local store has them for $3.75 each, which is $23 for 6 versus $40 for 6 (ouch) elsewhere. I cannot wait to try this soup. I wonder if the bean thread noodles would soften as much as rice noodles in this recipe? Has anyone tried them? They should soften the same or better. Test your soak time with the noodles you plan to use. But I use red bean noodles and they work excellently. I find them much more delicious than regular rice noodles. This is not Vietnamese pho. It's vegetable soup w/ rice noodles. Maybe it's pho 'Merican-style. Could probably make it a true Vietnamese pho if the broth was made prior and placed in a durable thermos. My question would be, what about the meat?! Are the Weck jars okay to use with hot water? Love this idea! Made a Thai style soup for lunch today--so easy! Yep, it's a Weck jar! I've been doing something like this for years, using packaged udon noodles. Dump the package, slivered pea pods, asparagus, red pepper, mushrooms, cilantro, basil, about 3 nice sized shrimp, into a quart container. Come lunch, just add water. Cheap, healthy, delish. Your Weck is much prettier than my quart sized plastic take-out container, though. I'm with Tara - what jar is that? That is the loveliest container, where is it from? Just about to ask the same thing! Love that jar.